Live It Up! Hillsborough Street has launched a new mobile-responsive website, just in time for the start of the school year! Users will find the site easier to navigate for merchant specials, events, and the rich source of studies and reports the organization regularly compiles. "Although the old site was an award-winning design, visitors to the district are very tech savvy and it was time for our website to step into the 21st Century," said David Dean, director of programs. Visitors can search merchant's menus by the type of food served or service provided and will find details on upcoming street closures related to events and Phase II construction. Additionally, parking tips and a detailed list of all the bus stops on the street are available. 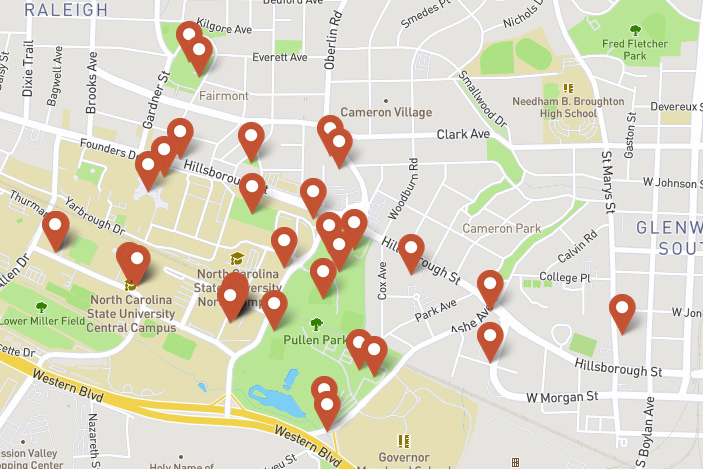 A frequent refrain of Hillsborough Street visitors is that parking is hard to find, but most are not aware parking is free on the street and N.C. State's campus after 5:00 p.m. nights and weekends. Nor, do they realize the Wolfline is free and that it connects to Glenwood South and the Warehouse District. Live It Up! hopes the new HillsboroughStreet.org will give the public the confidence to navigate the growing district, shop local, and support the many arts and culture attractions in the district.